This new house is located on a quiet country lane on the fringe of the hamlet of Plastow Green and two miles to the north of the larger village of Kingsclere with the market town of Newbury being about six miles to the north-west. Planning permission has been granted for a replacement dwelling in the Georgian design situated off the local lane running through Plastow Green. It overlooks it’s own garden and grounds amounting to about 6.5 acres. An ‘L’ shaped link at ground floor level connects the main house to the three bay garage block with staff flat/games room to the first floor. The attached computer images reflect the proposed design. 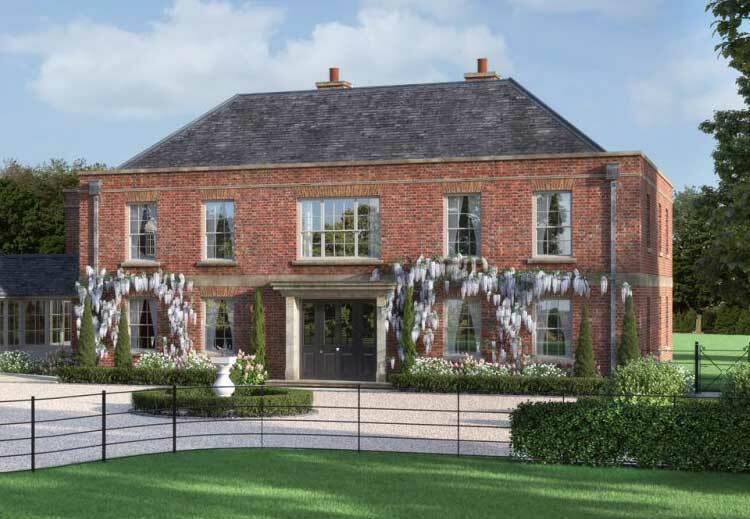 Work commenced in August to construct this new house of classical design together with modern interiors. Completion of this house will be in the autumn of 2018. The house will benefit from spacious and comfortable accommodation whilst incorporating the latest technological advances to complement today’s lifestyle. The elevations of the house will be constructed of handmade bricks with a clay tiled roof, Georgian styled sash double glazed windows with the heating and hot water system powered by a combination of oil fired central heating and air source heat pumps.